The RICHTER JB PASSIVE control plate is an easy mounting component for passive bass guitars like the Jazz Bass TM. It provides two independent volume pots and one tone control pot. A shielded PCB replace the wiring - therefore no shielding inside the instrument is required. 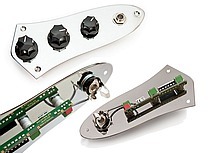 Two screw terminals for easy and solder free connection of two pickups and three additional screws to fix the control plate are a guarantee for quick mounting on your instrument - ideal for luthiers and replacement. This unit will mounted up to ten times faster than a hand wiring is done. With the high quality dustproof pots you won't have any problems with cracking noise during lifetime while turning the knob. The passive tone control is equipped with a film capacitor / COG capacitor which achieves best sound quality because of low losses and high linearity. Ready to use JB PASSIVE control plate for quick and easy mounting. High quality, dust proof pots. Low tolerance film / COG capacitors featuring lowest distortion and superior linearity. Completely shielded- no shielding inside the instrument is required. After manufacture each unit undergoes a throughout test and inspection. This ensures each unit passes strict quality standards. Serial number is carried out for traceability purposes.